Although this is set in Schroeder’s “Lockstep” universe, this story stands by itself. See related articles on Tor.com. 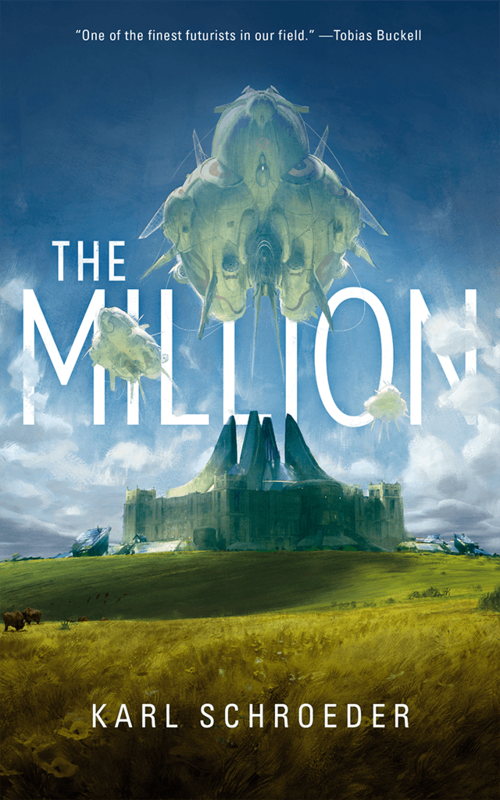 "The Million," by Karl Schroeder [bio], published on August 14, 2018 by Tor.com. Pro: This is the story of how Gavin successfully assumes Neal’s identity, becomes an auditor, and learns the truth about his own identity and about the world he lives in. Gavin’s a nice guy—we see that from the start with his fierce loyalty to his brother and father—and it’s fun rooting for him to succeed. Parallel to Neal’s story is Elana’s story, in which she finds her proper role in her family, finds someone to care about, and becomes an auditor as well. The contrast between her limitless wealth and Gavin’s complete poverty makes their partnership entertaining. The real star of the show, of course, is the setting. Much too big for one novella, it’s no surprise that there’s obviously going to be a sequel nor that there’s a novel, “Lockstep” set in the same place. Con: It’s a stretch to believe that Gavin escapes detection so easily. It’s also a stretch to believe that the people sleeping in Lockstep have survived so long, given that Jagand has no trouble getting into their storage space. Why do the Million bother to wake them up at all?